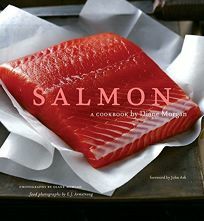 A beautiful cookbook with impressive photographs, Morgan's volume contains many tasty recipes, but it's not really a complete introduction to salmon. A number of her dishes are influenced by Mediterranean and Asian cuisine; others, like Pan-Roasted Salmon with a Pomegranate and Fennel Salsa, use the sparkle of trendy ingredients to enhance the fish's robust flavor. The prolific author (Dressed to Grill, Delicious Dips, etc.) introduces several unusual cooking techniques, urging readers to marinate, cure, preserve, deep-fry, poach, blacken, wok smoke, crust, slow roast, pan roast and grill their fillets, steaks and whole salmon. The recipes themselves, however, can sometimes be confusing, since they often combine the instructions for several parts of the dish into one paragraph, which can also make improvisation difficult. Nonetheless, Morgan offers variety that any fish-lover will appreciate. From Grilled Salmon Tacos with Chipotle Sauce to Risotto with Salmon, Parsley and Green Onions, to Asian Noodle Salad with Sesame-Crusted Salmon, her book has a dish for every occasion. An enthusiastic introduction covers such topics as cleaning and storing the fish, but readers already familiar with the salmon industry may find her handling of some of these opening topics a bit superficial. Clearly, Morgan is a cook, not a salmon specialist. Her discussion of the different species of Pacific Salmon, for example, does not explain flavor variations and seasonal changes (and what these shifts mean to the consumer) and, though she extols the virtues of the Copper River Salmon, she neglects to mention the fresher, larger and more frequently available salmon varieties from Southeast Alaska. Her book is a great resource for casual cooks, but those seeking a more authoritative compendium may want to look elsewhere.